These notes are intended as additional resources for my brief presentation for the Psychology Extension course at Harvard University. This is based on my personal notes while preparing for the research and the published research findings. I have written about them as a series. Read Part 1, Part 2, Part 3, Part 4, Part 5, Part 6, Part 7. This concludes the Mindful Movement and Deep Breathing a Self-Care Tool: MBX-12 at Harvard series. In this study of human endocrine and exercise physiology, we found that after participation in an 8-week MBX intervention, participants experienced normalization in basal serum cortisol concentration with concurrent reduction in PTSD symptom severity. What we focused on in our randomized controlled clinical trial to investigate the effects of MBX on PTSD symptom changes were four areas: effect on PTSD symptom severity, effect on serum cortisol, and effect on ACTH and DHEAS. Eight-week outcomes for the mindfulness-based stretching and deep breathing exercise (MBX) group were superior to those for the control (CON) group (mean difference for PCL-C scores, -13.6; P < .01; mean difference for serum cortisol concentration, 5.8; P < .01). No significant differences were identified between groups in any other items. PCL-C scores, 0.3; P = .85). Conversely, PCL-C scores in the CON group showed no significant change at 8 weeks (P< .657). We also analysed the 3 PTSD symptom subtypes of re-experiencing, avoidance, and hyperarousal separately. The MBX group showed a significant reduction in each of the 3 PCL-C symptom subtypes (P < .001). In the CON group, none of the PCL-C symptom subtypes were significantly changed from baseline. Our analysis of the study shows that MBX had comparable effects on all 3 symptom subtypes, resulting in improvement of both clinically and neurobiologically opposing symptom characteristics: undermodulated emotional dysregulation (re-experiencing and hyperarousal symptoms) and overmodulated emotional dysregulation (avoidance and numbness). * P < .05; † P < .001. Cortisol levels over time between groups showed a significant difference (P < .026). At postintervention week 8, basal serum cortisol concentrations were significantly higher in the MBX group than the CON group (P< .035), showing a significant increase in basal serum cortisol in the MBX group at postintervention (9.6 vs 14.7 μg/dL; P < .004). The CON group showed no significant change in serum cortisol concentration (12.9 vs 13.8 μg/dL; P< .549). At the 16-wk follow-up, the changes of cortisol in the MBX group were maintained (14.7 μg/dL at week 8 vs 13.5 μg/dL at week 16; P < .599). We found no significant difference in plasma ACTH and serum DHEAS levels at week 8 in both groups. This may be due to the small sample size of our study and the reliance on biomarker measurement taken at 1 point in time. Our study demonstrates that improvement in PTSD symptoms is correlated with normalization of cortisol levels. 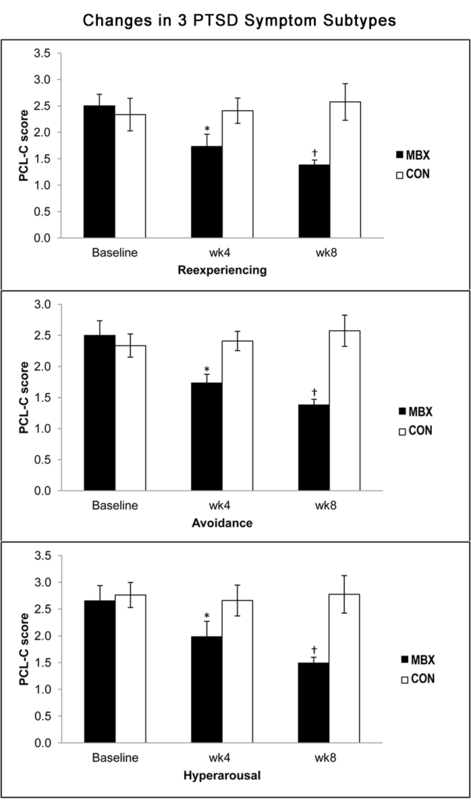 As seen in the figure below, PCL-C data from baseline and week 8 are plotted as a function of serum cortisol for each of the participants in the MBX and CON groups (n =43). 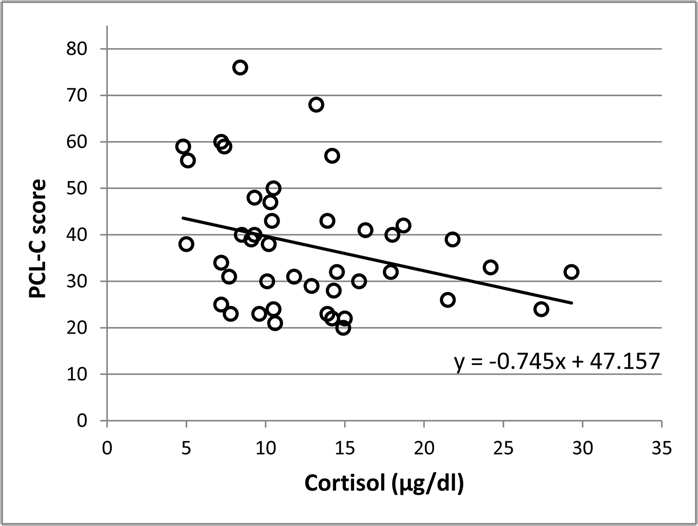 The results show a significant relationship with a slope of -0.75 (P = .048), indicating that for every 1 unit increase in cortisol there was a mean 0.75 point decrease in PCL-C score. To our knowledge, this is the first randomized controlled trial to examine the therapeutic benefits of MBX in nurses with PTSD symptoms using both biomarkers and self-reported symptom severity scores. 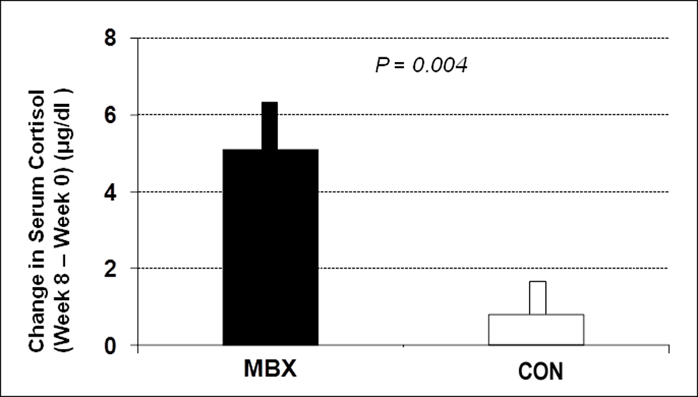 This study shows that participation in 8-week MBX is associated with a significant reduction of PTSD symptoms and an increase in serum cortisol in the MBX group compared to the CON group. Participation in an 8-week MBX program yielded a 41% reduction in PCL-C scores and a 67% increase in serum cortisol concentration, whereas the CON group showed a 4% decrease in PCL-C scores and a 17% increase in serum cortisol. 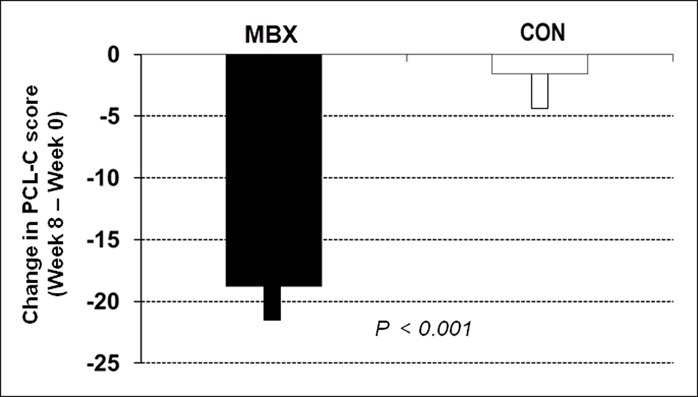 The pre- and postintervention analysis shows that MBX significantly reduced PTSD symptom severity, whereas serum cortisol concentrations moved toward the range that is normal in healthy individuals. The effects were maintained for 8 weeks after the intervention. The improvement in cortisol suggested that normalization of cortisol levels may have occurred as a result of the intervention. Together, these data support our hypothesis that reduction in PTSD symptoms is positively associated with changes in cortisol levels as a result of participating in an 8-week MBX program. During the 8-week program, some participants reported that they experienced improved sleep, stress resilience, energy levels, and emotion regulation under stress, and a resumption of pleasurable activities that they had previously discontinued. At the end of the intervention, over half of the participants expressed a desire to continue. Given the hurdles to compliance with current PTSD treatment options, the high levels of voluntary adherence to the MBX intervention suggest that it may be an attractive self-care option. A unique component of MBX interventions vs typical low- to moderate- intensity exercise is the inclusion of slow, deep breathing in synchronization with the exercise movements. Slow breathing is known to have a balancing effect on the autonomic nervous system via enhanced parasympathetic activation. Slow and deep breathing stimulates stretch-induced inhibitory signals and hyperpolarizes currents propagated in cells, leading to synchronization of neural elements in the heart, lungs, limbic system, and cortex. Slow breathing also enhances vagal activity, leading to reduced psychophysiological arousal and decreased sympathetic activity and stress responses, and it is associated with reduced PTSD symptom severity. Changes in cortisol concentrations maybe important in understanding the pathogenesis of PTSD, clinical assessment of physiological responses to stress, and treatment of PTSD. Recent studies have shown that lifetime PTSD is associated with lower cortisol levels; changes in cortisol predict clinical response to PTSD treatment; individuals with PTSD and lower urinary cortisol levels are less responsive to psychotherapy treatment. This study is limited by the small number of participants, who were predominantly female nurses with PTSD symptoms. As such, there may be limited generalizability of the outcomes to males or individuals with combat-related trauma. For more information on the study limits, please refer to our publication. In our study of human endocrine and exercise physiology, we have demonstrated that after participation in an 8-week mind-body exercise intervention (MBX), participants experienced normalization in basal serum cortisol concentration with concurrent reduction in PTSD symptom severity. Considering that early intervention is critical in ameliorating the development of PTSD and that PTSD symptoms are strongly correlated with the degree of distress immediately after trauma, mind-body interventions such as MBX may provide an effective nonpharmacological treatment for individuals with PTSD symptoms. I would like to offer my sincere thanks to the nurses and staff at the University of New Mexico Hospital for participating in or supporting the study; to the members of the UNM Clinical and Translational Science Center for funding and facilitating the research site and data administration; to the NIH Clinical Center researchers for revising the manuscript and inviting me to present the MBX Mindful Movement at the National Caregiver’s Day; to the editors of the the Journal of Clinical Endocrinology and Metabolism for scientific rigor for evidence; to the faculties at Harvard’s Institute of Lifestyle Medicine and Psychology Department for inviting me to present MBX 12 and research findings; to the faculties at the Oxford Mindfulness Center of the University of Oxford for sharing their valuable knowledge for teaching mindfulness in non-clinical settings; and finally to my teachers and colleagues and students in martial arts community all over the world for instituting and practicing the values of martial arts for the enhancement of humanity. For references, please read the original article of the study. 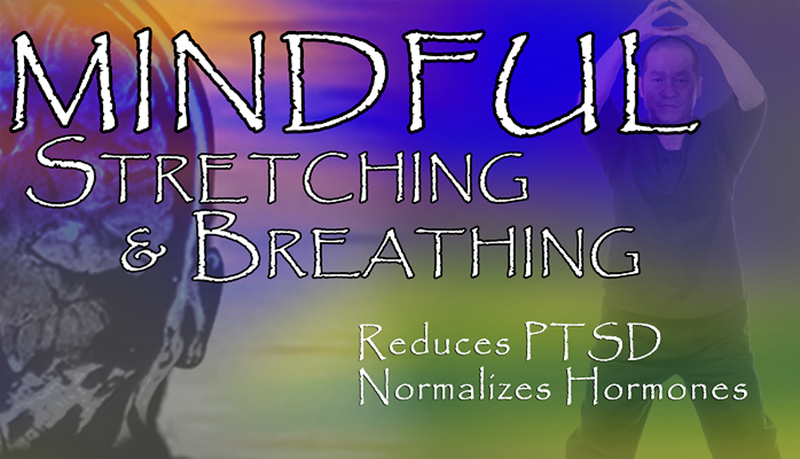 For related articles, check out: How Mindfulness Training Could Help People With PTSD Symptoms, Meditation, stretching may ease PTSD symptoms, Stretching, meditation eases PTSD in nurses, study shows, Can Meditative Breathing Relieve PTSD Symptoms For Vets? This entry was posted in clinical trial, MBX-12, Mindful Movement, Mindfulness and tagged ACTH, cortisol, DHEA, harvard, hormones, nurse, PTSD, Sang H. Kim, self-care, self-care tool, stress management. Bookmark the permalink.